Hypermethylation at the promoter region is an important epigenetic mechanism underlying the inactivation of tumor suppressor genes and frequently occurs as an early event in the development of different types of cancer including colorectal carcinoma (CRC). 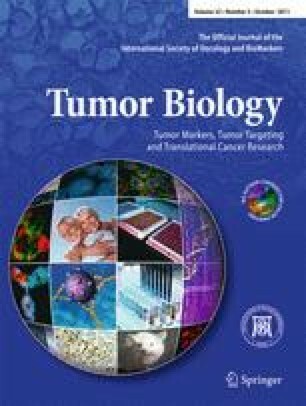 The aim of the present study is the detection of methylation status for some tumor suppressor genes including RASSF1A, MGMT, and HIC-1 in both cancerous and precancerous lesions of colorectal mucosa to evaluate the possibility of developing epigenetic biomarker for early detection of Egyptian CRC. Tissue biopsy was collected from 72 patients (36 CRC, 17 adenomatous polyps, and 19 ulcerative colitis), and in addition, adjacent normal-appearing tissues were collected as control. Promoter hypermethylation status for RSSAF1A, MGMT, and HIC-1 genes was detected after isolation of genomic DNA from the tissues samples using methylation-specific PCR technique. High frequency of methylation at MGMT, RASSFA, and HIC-1 was detected in CRC patients (25%, 47.2%, and 41.7% respectively). The highest methylation detected in adenomatous polyps patients was in MGMT gene (47.1%) followed by 35.3% for HIC-1 and only 5.9% for RASSF1A gene. HIC-1 gene exhibited highest frequency of methylation in ulcerative colitis patients (57.8%) whereas it was 26.3% for both RASSF1A and MGMT genes. A nonsignificant association was recorded between the methylation status in different genes examined with the clinicopathological factors except the association between methylation at RASSF1A gene with gender (p = 0.005), and it was significant. In conclusion, aberrant hypermethylation at promoter region of RASSFA, MGMT, and HIC-1 genes is involved in Egyptian CRCs. Hypermethylation of MGMT and HIC-1 genes plays an important role in the initiation of disease especially ulcerative colitis–carcinoma pathway. An erratum to this article is available at http://dx.doi.org/10.1007/s13277-011-0206-1. We are grateful to Prof/Dr Abdel Maguid Kasseim, Tropical Medicine Department, Faculty of Medicine, Cairo University, for providing access to the samples and data used in this work.